"Secession inevitable." Such is the hue and cry from the south, but many more union men are to be found today, at least those who are bold enough to proclaim their feeling and sentiments. Lincoln's message has been read by millions and has been endorsed by hundreds of thousands. It only covers three colums of the B. Journal, conciseness marks it [its] beauty and the truths it promulgates are finding symphathizers all the country over. It is all we could expect, hope and desire. The chicago platform stands under it and Lincoln on it. The policy foreshadowed is what the country needs, & the man who wrote it evidently means what he says. What a contrast between that and Buchanan's last annual message. Decision, energy, and future determination mark the one; policy, truckling subserviency, and indecision, with want of courage to maintain the ground advanced, mark the other. The future is waiting for in silence, the policy of the states assuming their independency will be for weel or woe, on them depends peace or war, provided a course intermediate be not resolved on by the Republican leaders. Should they maintian their hold in the south and by reinforcement make it sure war may and may not be the issue. Should diplomacy be commenced and linger along, it may yet straighten affairs. Raining, cold and miserable weather generally. New Hampshre election is being talked of all over the country as we are the first to vote on State affairs after the new Administration came in power and since the troubles reached the culminating point. The actions of the Republican party will be avowed or disavowed and this vote will tell what New Hampshire thinks on the subject. Barber went over to the Plain to pay his respects to the Selectmen of Plainfield but one was sick, one would agree to have his name on the list and the other wouldn't; so their plan will be to frustrate justice by tricks. For sometime have been thinking over the future of what should be; so far life has not been labor and independence as it should be and now must form my plans for the future. I have written Father of my willingness to engage in commercial or a physicians life and expresed the preferebce for the latter as it will give me more of an intellectual and literary life. Authors and educated men will be those among whom I shall be placed and from them can derive more pleasure and of course hope I can fill a sphere where I can do good as well as gain pleasure. Mr. Roberts one of our Friends who keeps boarding house here died yesterday of Heart disease. This day comes but once a year and when it does come do not the people turn out in full force to show how slow democracy dies, it heaves, groans, and all will soon be over. This day presents a motley sight to a lover of the grotesque and hideous, who congregate around the doors and wiskey barrel, or the old and blind who are to be found at the ballot box, too old infirm, and weak to walk, must be placed over the ballot box in order to save their country. New Hampshire from appearances has redeemed and kept bright her fair name, at least Plainfield is making rapid strides that way as from the report she has gained some ten or fifteen voters, this morning Buchanan and I tried to have our names placed on the checklist, but no go. Deciet[sic] and party influence has worked deep into their veins and a plan has been concocted to work things to their own advantage but I assure them that if they catch me a napping they will, that's all. [Lynus?] Smith was sick and could not appear, but as I thought best to call on him, I found him in bed with his clothes on and he soon became interested, when he began to improve rapidly. B.C. Daniels was willing to put the names on, but as John B. Rowell was not, he could of course say so and not hurt the party, nor would our names go in. Yesterday Buchanan and myself drove over to Lebanon, and had Barber for company, to see if it was not best to arrest J. B. Rowell and have him bound over for the trial next fall. Consulted Craggin also Tolles and both thought it best provided all parties here were assented, but they had not time so came back and consulted with a few friends, of P. [Chelis?? ], Raynsford, Greely; Penniman, James Wood, and other, it was agreed Barber and myself with Aurthur Spaulding should go to Claremont for Gardner & Vaughan and have Rowell Arrested. Last night we drove down and had our arraingments made came home today and tomorrow the Sheriff will be up and a Justice from Lebanon West. Democracy has held sway so long it is hard to bring other influence to bear, but now the republicans are started and bound to find out whether or no they cannot have all their men at the Polls, it would seem strange if some good did not come out of it. Very pleasant and today destined to be very warm. For a few weeks past have wished to commence my diary again, but till yesterday have not found courage to try but sad news tells me plainly if I wish to remember my friends "notes by the way side" will accelerate sluggish thought. Last evening's mail brought be a Globe from Isaac containing the painful news, of the death of my friend John M. Mitchell, a sad a melancholy end. The account was headed "Distressing Accident", it was enough, but when underneath was "Three young gentlemen drowned," the story was more plainly told. How quick the mind can grasp a truth when a few circumstances are known, for in this case it was uncessesary for me to read even the names for the fact, and who one of them was; the particulars came more slowly, but thoughts of the past, of our parting came more rapidly, and for once honest, heartfelt, tears of sorrow came. [Attached is the notice of the accident] All my past life seemed to pass before me, thoughts unthought crossed my mind, and life seemed to be dark and dreadful, but a gleam of light passed before all, and revived my gloomy meditations. Yes, a gleam, kindled by a kind heart, whose gentle words lead me to trust and confide in one more of the human species, and that to a woman, and if that gleam but grows and expands as I trust it is, then will future events be tempered by a love, and trust in one whose power to save is Almightly. "The ways of God are past finding out," for little did I expect as Thursday night Aug. 1st we sat talking of the past, of the marriage just ended, and the future that death's rude hand was so soon and in such a mysterious manner to call one of us away. That afternoon we had talked over the qualities of the boat, Yacht "Wave," the manner of loading and ballasting her, of the course they were to travel, and my own desire to go, had not duties called me here. Pleasure was the end desired, all then tended to that end, and so Willy Gordon came up to see his sister, who was staying with us till after Lizzie�s wedding, and we talked of the pleasure anticipated, we all joined in in wishing him and the rest a fine voyage and merry time. But alas! That good bye was his last and final adieu to us all, and how that sister will mourn his loss, love unsullied bound all that family together. Three years a half or perhaps it may have been four years ago Gordon McKay were doing buisness in Hamilton, also John and I were there, while Bob Holmes is still there, we were all well aquainted, while john and I were as intimate as brothers. Wreck of the Yacht "Wave." It is our melancholy duty to report that on the night of Monday, during the prevalence of the storm, the yacht Wave, which had been on a cruise down the lake with four young gentlemen on board, was completely wrecked outside the Island and that three out of the four persons were lost. The names of the unfortunate yound men are Mr. William Gorden, Mr. Pierce E. Morton, and Mr. J.M. Mitchell, all well known in Toronto. Mr. Robert Holmes, of Hamilton, the fourth, was almost miraculously saved by clinging to a plank and swimming ashore. A week ago last Thursday, Mr. Gordon and nephew of Mr. Mackay, of Messrs. Gordon and Mackay, Wellington-Street, Mr. J. M. Mitchell, a student in the law office of Messers. Smith and Wood, and Mr. P.E. Morton, formerly in the naval service of H.E.I. Company, left Toronto harbour for a cruise on the lake in the yacht Wave, a vessel of eight tons burthen. On the second day after their departure they paid a visit to Hamilton, at which place they were joined by Mr. Robert Holmes. Having got a stock of provisions on board, the yacht's head was turned down the lake, and Rochester, Sodus, Oswego, Cobourg, and Port Hope, were visited, and all on board were in high spirits and well pleased with their cruise. About twelve o'clock they left Port Hope for Toronto, with a strong breeze blowing from the south-east. At five o'clock in the afternoon they were opposite Scarboro' heights, but by this time it was blowing a perfect gale. Mr. Holmes and Mr. Mitchell suggested that they should run the vessel into Whitby harbour, but the others were of opinion that they could easily reach Toronto. Owing to the violence of the gale, and as the waves were lashed into a perfect fury by the wind, an attempt was made to double-reef the mainsail, but in the attempt the "throat of the gaff" was carried away. Shortly afterwards the jib was also carried away, the yacht then running under bare poles. About half-past six o'clock in the evening those on board "sighted" Toronto light-house, on the western end of the peninsula, and an attempt was made to run into the harbour by the eastern channel, but it proved unsuccessfull, and the vessel was driven hither and thither by the violence of the winds and waves. All this time the rain had been descending in torrents, and, to add to the misfortunes of those on board the little craft, darkness began to come on. About eight o'clock, Mr. Gordon and Mr. Morton went on deck to relieve Mr. Holmes and Mr. Mitchell, who had been "keeping watch" from four o'clock, and Mr. Holmes retired below, leaving the others on deck. He pulled off his shoes and stockings and then sat down but he had hardly taken his seat, when a huge wave broke over the port side and completely engulphed the tiny bark. He rushed to the deck but could see nothing of his friends; and the vessel was rapidly sinking and breaking up under his feet. In an instant he was in the water breasting the waves, which were running very high. He seized hold of a portion of the cabin floor and the seat on which he had been so lately sitting, and these proved of great assistance in keeping him afloat. Just as the yacht was sinking into the sea, Mr. Holmes descried Mr. Mitchell about ten yards distant from him in the water. Mr. Mrichell shouted out, "Is that you, Morton," when Mr. Holmes replied, "No, it is Holmes." "Hold on then, Bob, if you can," replied poor Mitchell, and with these words he disappeared from the sight of his companion. Mr. Holmes looked about as well as he could when he gained the crest of the large wave for the others, but observing no traces of them he used every endeavor to reach the land. After being buffeted about for upwards of an hour, swimming with one hand while he held on to the plank with the other, and fearing that he would never reach terra firma, he was suddenly thrown on the beach of the Island, east of the gap. He crawled on his hands and knees for a short distance and was soon beyond the reach of the receding waves. Perceiving a fisherman's hut a short distance off, he went to the place and gained admittance. It proved to belong to David Ward, fisherman, and Mr. Holmes was most hospitably received. He was provided with dry clothing, the best the house could afford, and everything was done to make him comfortable in his weak state. He was very feverish throughout the night, but in the morning he was quite revived, and looked out anxiously for indications of his missing friends. No sign of them was visible, and Mr. Holmes came over to the city to telegraph to his parents in Hamilton, and to communicate the sad news to the friends of the lost. Later in the day, Mr. Holmes visited the Island, accompanied by some friends. They observed some portions of the wreck floating about in the lake, but they could find no trace of the sufferers. There can be no doubt that they have all met a watery grave. Strenuous efforts will be made to recover the bodies, but it is feared that this will be a work of time. Mr. Wm. Gordon was but 19 years of age; possessed of good abilities, energy, perseverance, and correct buisness habits, he had the fairest prospects of success in life. A widowed mother mourns the loss of her youngest son. Mr. J. M. Mitchell was a student of University College and engaged in the study of law at the same time. He had good abilities and extraordinary application and ambition and promised to rise to eminence in his profession. His parents reside in St. Mary's where they received the news of the accident yesterday evening. Mr. Morton was a native of England, and had only been a short time in Toronto. He had served for a period of nine years as midshipman in the East India Company's service. He resided with Dr. Curtis, Dentist, King-Street-west, and it is rather remarkable that Dr. Curtis strongly dissuaded him from going on the cruise, expressing a fear that he might be drowned. At the Doctor's request he gave instructions regarding what he wished done if he did not return. These instructions, though laughingly given, will now prove usefull and enable the young gentleman's friends in England to be communicated with. "The dead! The glorious dead!--and shall they rise? Shall they look on thee with their proud bright eyes?" New thoughts have arisen and taken strong hold of me; "the end is not yet," requires the solving of a problem as to our capacity which none can ever fairly answer. But that we meet after death, that our course is one of progress, and according as we live here will our progress be, are awakening new desire. From the fire kindled last spring at Meriden, the blaze has burned feebly sometimes, till a gust come along and revived it, and now I feel as if I could trust God and let the future care for itself. Every book, paper, or whatever came before my eyes seem to be inscribed with John M. Mitchell's name; such sad news come seldom. A few words of the past: I continued at Meriden till graduation July 18th when finished my stay there. Drove over to see Julia and found John McQ. [McQuesten] there farming, had a pleasant visit of two days, when returned and went to Manchester. There I found a letter from Isaac and Lizzie wanting me to go home and attend the wedding Aug 1st. Accordingly packed my things started for Canada and after an absence of three years and two months once more trod on familiar ground. Very warm and pleasant; a good shower would be acceptable. Will now continue from last page. Arrived at home just the Friday before the wedding, which left me just one week for a visit, as I wanted to be here as soon after Aug 1st to attend lecture as I could get round. My time being so short found very buisy running around making calls and being usefull at home. Found Miss [E.?] Childs of the Falls staying with Lizzie, as a sort of companion to keep up her spirits, for on trying occasions the women all rush to one another for assistance never relying on self. Being disposed the same way I made friends with Gertie Childs, thus time passed till the day when Miss Helen Gorden of Toronto came up with the big cake, so had one more for company, although by the way did not have Lizzie as companion, she being occupied with self and Mr. Archie McKeand. The same evening John M. Mitchell came up, and once more we met and enjoyed the pleasure of talking over old times. Father being called to Manchester this state to see Uncle Samuel was just living, all the ceremony devolved on me, and "I gave Lizzie away." All past off very pleasantly indeed; and then John and I talked till half past four, when we retired. Not being well did not leave till Saturday when Miss Childs went home and I accompanied her as I had to wait some four hours for the train. THE WRECK OF THE WAVE-TWO OF THE BODIES FOUND. The search for the bodies of the unfortunate gentlemen who were drowned in the Lake on Monday last has been prosecuted every day since the sad accident, and has resulted in the finding of two of the bodiesm that of Mr.J.M. Mitchell and Mr. P.E.Morton. On Saturday forenoon a coat was washed ashore on the Island which was identified as having belonged to Mr. Mitchell, and in one of the pockets was found a handkerchief with his name on it. About six o'clock the same eveing, an attempt was made to move the yatch, which is lying a short distance from the Island, and the body of Mr. Mitchell floated to the surface and was brought on shore by Mr. Gordon, of Messrs. Gordon and Mackay, and James Humphreys. In the evening Coroner Scott held an inquest on it in the Albion Hotel, and a verdict of "Fround drowned" was returned. Yesterday (Sunday), the body of Mr. Morton was found near the same place, and Coroner Duggan held an inquest in the afternoon, when a similar verdict to the above was rendered. No trace of the remains of Mr. Gordon has yet been found. Warm with a southwest wind. This time will finish the chronicle of the past in a very summarily manner. Arrived at the Falls with Gertie at noon, but missed the evening Train so waited till the 10:30, hence could not arrive in Albany till 8 a.m. Sunday, but had a pleasant time. Must relate little circumstance in which carlessness was visible; Father in putting up his wine found it necessary to use all the bottles he could find, so in some manner a bottle labeled "Copal Varnish" found its way among the assorted lot. Sad bottle of wine I gave Gertie to take home where in due time it arrived and was opened immediately and lo and behold surprise was visible and disappointment apparent for neither was it Copal varnish or wine, but a mixture. So having two bottles in my trunk when at Albany I sent one back by express. Came by way of Saratogo, Rutland and Bellows Falls where I met Joe Stone and spent a few hours with him, gave him the other bottle of wine. Came up to the Junction and Bartholomew met me with a team, so arrived here safe but sick, and am now studying for an M.D. I like very well and am getting on very finely. Thus am destined for three years more study. We have a good class numbering some 48 or 50. Raining all day cleared off at evening. The College boys are coming in, among whom are a number of my class at Meriden and Horace Russell, Sawlette and Ed Richardson who were intending to go to Union College. Cobleigh; Sargent; Rowell; Haile; Dimick; Marsh; Thompson; &c. &c. have arrived and ready for duties tomorrow. It looks more pleasant to see old faces, and I feel less like studying just now, as my attention is taken up with them. But the great object with me is to fit myself for duties, so while hear have a task worthy the powers of a greater understanding than mine. The Lecturers are men of talent and ability. From whom much that is required can be gained, and from close application next fall and the intermendiate time shall hope to derive great benefit, and be able to know somewhat of what may lie before me. My object now is to remain here till after the next course of lectures and then if Dr. Crosby will get me a situation in the hospital in Boston shall be in a fair way of gaining my end. I have to attend four lectures in the morning, one hour each and one in the afternoon, and mighty uncomfortable seats to set on. Had a letter from Joe Stone, in which he says the bottle of wine I gave him was "very fine Ale" and not "very fine Wine," thus you see the history of three bottles of wine. The college term commences today, also the college year, providing means for freshmen to advance one step higher in order to permit them in turn to have the handling of freshmen. One would think that the Senior are somebody; Juniors, nobody, Sophmores a little of the Satanic origen; and Freshmen the amusers of the Soph's; while the poor Chandlers are nowhere. Here the great game is football and Freshman have to find Balls, which average one a day. And to facilitate matters they the Soph's gather inder the recitation window of poor freshman, when a howl of football arises, loud and course enough to awaken the sluggish brains and quicken them to renewed activity preparatory to general stampede for their several rooms. At all hours of the day the incessant howl of foot ball may be heard well when footballs appear they play all manner of party games, but most always lug the ball away or cut it, so poor freshy has to produce another. Electioneering is another great source of amusement to a "hanger on," and think I shall stump the State for myself next spring, as I have been taking lessons from the Juniors and Seniors. Weather very warm, and our seats very hard, add little to ones good times, while school boys. Time fly's ]sic] on wings of untiring power; armies are marching and countermarching; great nations are vacillating between policy and pocket; yet Freedom must triumph, and free men walk where despotism has held sway for years. Major G. B. McLellan is a vigorous and energetic general; Scott is working things to suit himself, which will soon reveal an array ready for battle 225000 strong around Washington. The bringing of General Wool into action was a good act although said to be done by New York money, while following the advice or example of the south in preventing too much reporting, and collecting various seditioners, is a move in the right direction. The west can care for herself, young though she is, her bone and sinew will be felt south to an alarming extent before this war is through. Though Gen. Lyon is dead, Gen. Freemont is ready to guide affairs himself and many able officers can be found, whose place can be filled by no others, as they are foreigners. have seen despotic rulers and they believe force and iron rule alone will subdue rebels. Drove to Meriden found 100 students had arrived, small term. Times are progressing much as usual, false rumors, concocted some two days to two weeks, are to be found in every journal; advances, retreat, battles &c, &c, are not so often as reported. What our force is around Washington I am unable to find out, "mum" seems to be found in our dictionary, now it is evident that the federal forces must be apportioned to the rebel forces if they have as they clain 200,000 men in the field, it certainly is necessart for us to 250,000. While around Washington we should have two men to their one. Fears are sometimes entertained for the Capital, but [military?] men consider it safe, and Beauregard is watched, his movements are known, and counter irritants are given. But I fear too much confidence is place in our ability and the rebels underrated, perhaps Bulls Run may awake a more thorough knowlegde of affairs. Some important arrests are being made revealing how thoroughly the plans, fortifications, and movements of our army are made known to traitors. Policy ought long ago to have dictated a more quiet course, and the suppression of many rabid secession papers, while a coat of tar ought to be administered to many a renegade in these parts. Passing from the reports we hear relative to the danger of the Capital, to probabilites, there seems no reasonable prospect of danger if so more strenuous efforts would be made to place it out of danger. One things [sic] seems certainly to my mind viz: that Americans are supposed to be somebody equalled by nobody, and worthy of every body's respect unlimited. Our papers go off in fury over the remarks made by English and French journals, every thing they say not favoring us, is contorted and twisted till it means sympathy with the rebels. In my poor estimation some fault may be found with English modes of doing business, but for the American people to say that England will recognise the Southern Confederacy is improbable; that her fleet is to open the blockade is untrue; and her increase of army in Canada is with an aggressive view is unfounded and unreasonable. Or to believe England for the sake of coton will break and join the South is preposterous, for one can see policy would dictate another course, and coton can be supplied from other sources. The north can have few friends unless she deals more liberally with others and follows up treason a little closer. Returned this evening from Plainfield Plain where Dr. Crosby had a job of amputation at the Shoulder joint. Bartholomew and I drove and [about-crossed out] seven other of the students. The patient was a young lad who had taken a gun out chopping and seeing a hawk had gone in pursuit of it, when diverted by smaller prey as a mouse stopped to kill it. In his endeavours his gun lock cought on a stone drew the hammer up enough to strike fire by the caps and the contents were lodged in his shoulder or arm, breaking the os humeri about an inch and a half below the joint. Dr. Phelps was called, when he sent for Dr. Dixie, together went to work, Dr. Phelps assisting and we boys looking on each ready to hand any thing wanted or make ourselves useful. Bart gave the chloroform and I stood by Dr. Crosby and tied one artery. The job was well done and a fine one for us, but poor boy it is a sad loss to him. Dr. Crosby and Bart use all their influence to have me remain this winter, also to spend two years here, so feel as if I would be well treated and have a good chance to see all operations worth seeing. On many account think I could do well by remaining but whether I cannot do as well by going some place is to be decided, especially after the first year. Today I start for Newport to attend to the selectmen of Plainfield. Some fear we can do little but perseverance and will alone can tell, but one thing certain poor Rowell did not get West so fast as he intended, nor was the case so broken up as could not be attended to and unravelled. No doubt but I am hated by many good democrat of Plainfield, but man's ill will can not drive me. Good news came in and should tomorrows telegram prove it, then we can hope for a battle on our own ground, or a retreat of the enemy. That Cape Hatteras is a commanding point is very plain, but that it should be so weakly defended seems unlikely, and to be taken without the loss of one life on our side seems equally strange while the loss on their side is variously estimated. General Butler is just the man for any bold stroke and Com. Stringham is a brave officer, so the two combined gave a decision to the undertaking, and will be a grand start for excursions into North Carolina thus dividing the rebel army for they must look out for home affairs. The West is about as is has been, quiet but effectual means are being made to keep rebellion down, and General Forcemont has proclaimed marshal law throughout Missouri. It is a setter. It will make some growling, and set some niggars free. Returned from Newport this evening having accomplished all that was anticipated. My case did not come on, but the grand jury found a Bill against Rowell and Daniels. It may be the war or some other reason, but certainly Newport is deserted, there were not half the men to be seen that there usually is, walk the streets from one end to the other and you meet none but those on buisness. The ["search"?] feelings seem quite strong in many places among the hills of New Hampshire, many avow their sentiments openly, other more cooly, but the fact of its existence is a disgrace to every true american. Had quite a visit at Meriden and found a great change: mostly new students and not extra smart, but the ladies form a more attractive circle than ever before. The first day of a New Year and the first also of my dissecting. The old year is past and with it many kind reminisences], while death has removed many friends and relations, and am not now as willing to meet my God as when I came here five months ago. Absences from Christian friends has removed the glowing feelings with which I commenced my studies, yet the very fact gives me hope, that in knowing and feeling my state, I may yet know Him, whom to know aright is life everlasting. The term commenced on the 6 or 7th [lt?] and today Dr. Thom. and our subjects were ready for operations, so began our perperations[sic] after dinner; prepared our clothes and bandagges [sic] and a few of us took the first cut, as a smoothing of the way for tomorrow; it being a squirmish job we squirmed a little, but what can't be helped must be endured, so at it we went. There are ten of us, five on a subject viz: Moody, G.O. ; Bartholomew; Matheson; Chase; and myself on one; Davis, Brown; Merriam; Whittaker; and Baxter on the other, all are good friends as far as necessary for peace, so have a good time. Spent this evening with Ingrahm and we had a pleasant time, then came home and put up a comic head over my centre table, and then made myself aquainted with Hodges Dissection for an hour. 1 For complete Diary, (April 4, 1859 to January 2, 1862)see also Box 15-001a, Box 15-001b, and Box 15-001c. Although the diary does not continue after this date, a letter written by Dr. Calvin Brooks describes the assassination of President Lincoln in 1865, see: W-MCP4-6.064, also W-MCP4-6.65, W-MCP4-6.66, W-MCP4-6.68). Some of Calvin's friends, other medical students, studied in Europe: London, Dresden and Vienna, and their letters describe their medical studies, the various surgical methods and techniques, their experiences with learning the language, and the social conditions there. J.H. Whittemore and Moody are Calvin's fellow medical students who are studying medicine abroad. Dr. Whittemore and a mutual friend, Dr. George O. Moody, wrote several letters to Dr. Calvin Brooks from Ireland, Germany, Austria, Italy, London and Boston, where they were studying medicine in 1871-72 and 1877. They described their travels and studies in the various medical centres in Europe and encouraged Dr. Calvin Brooks McQuesten to join them, but he did not do so (W1256, W1321, W1327, W1333, W1336, W1337, W1344, W1348, W1354, W1357, W1486). 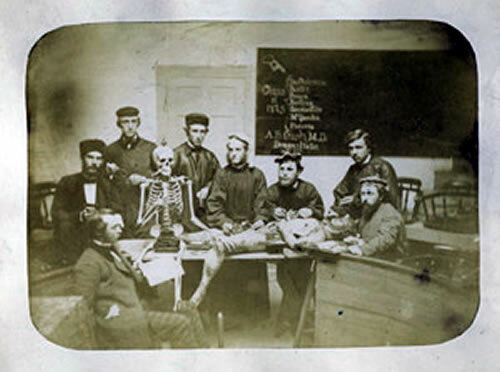 2 It is likely that Calvin is referring here to dissections or autopsies to be performed on women--note the attached photo for a somewhat macabre and comical illustration of a staged autopsy being performed by Dr. Calvin and some of his fellow-students--their names appear on the blackboard behind them. For more information on Dr. Calvin Brooks McQuesten, search "Family" on the Home Page and then click on his photo.